Pugliese, oh Pugliese… how thy mouthwatering goodness defies description and curries favor with holiday diners of all ages. You’re an Italian marvel, a baker’s treasure; the purest of gems mined from the oven of ages. Pomegranate & Basil Bruschetta - sweet, yet salty, fill our palates with pleasure, our stomachs with smiles, and satisfy the appetites of our legions of basil-loving balsamic-vinegar-drizzling admirers of all things too good to give up, too delicious to deny, and beyond the ability of any mere mortal to resist indulging in. 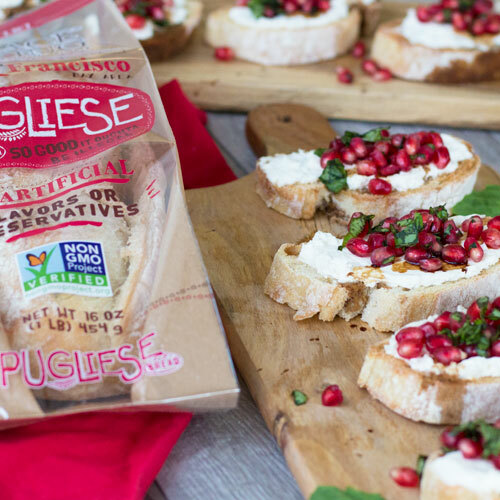 Pomegranate & Basil Bruschetta, you are deserving of praise, and endless salivating adulation. Preheat oven to 450ºF. Arrange sliced bread on a baking sheet, and bake until golden brown (approximately 10 minutes). In a medium mixing bowl, combine pomegranate arils and basil, and toss gently until combined. Spread Ricotta on each slice of toasted bread. Top with pomegranate mixture and a drizzle of balsamic vinegar.